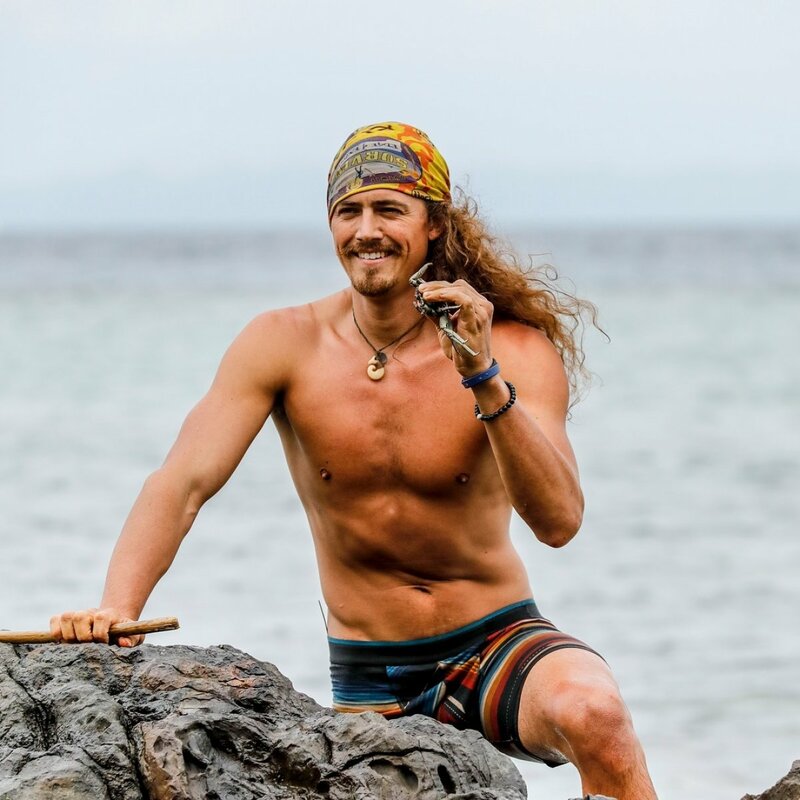 Joe, a 29-year-old multimedia artist from Chandler, AZ, who currently resides in Ogden, UT, and previously appeared on Survivor: Worlds Apart and Survivor Cambodia: Second Chance, was voted out of the game by the newly-merged Vata tribe on Night 19 through a 6-3-2-2 vote at Tribal Council. Joe became the seventh person voted out of Survivor: Edge of Extinction and the fourth member of this season's jury. "The one thing that I feared happening, happened tonight. I'm trying to keep my emotions together and not break, but maybe I need to be here," Joe said following his vote off. "The theme of the merge flag was a phoenix, that you've got to die to be born again, and that's exactly what I'm going to do this season." David Wright, a 44-year-old television writer from Philadelphia, PA, who currently resides in Sherman Oaks, CA, and previously appeared on Survivor: Millennials vs. Gen-X, received three votes. Rick, a 33-year-old morning news anchor from Blacksburg, VA, who currently resides in Macon, GA, received two votes at Tribal Council after winning his way back into the game by finishing the "Edge of Extinction Competition" in first place. In addition, Wendy Diaz, a 25-year-old small business owner from Los Angeles, CA, who currently resides in Bell, CA, and Keith Sowell, a 19-year-old pre-med student from Fayetteville, NC, who currently resides in Durham, NC, decided to quit the game. The Survivor broadcast began on Day 17, with the three tribes gathering to meet host Jeff Probst. The Manu tribe was comprised of Victoria Baamonde, a 23-year-old waitress from Bronx, NY; Gavin Whitson, a 23-year-old YMCA program director from Erwin, TN; and Eric Hafemann, a 34-year-old firefighter from Chicago, IL, who currently resides in Livermore, CA. Lesu was comprised of David; Kelley; Lauren O'Connell, a 21-year-old student at Baylor University from Bakersfield, CA, who currently resides in Waco, TX; and Dan "The Wardog" DaSilva, a 38-year-old law student and former military man from Ossining, NY, who currently resides in Los Angeles, CA. And Kama was made up of the following members: Joe; Ron Clark, a 46-year-old teacher at Ron Clark Academy from Chocowinity, NC, who currently resides in Atlanta, GA; Julia Carter, a 24-year-old medical assistant from Hazleton, PA, who currently resides in Bethesda, MD; Aurora McCreary, a 32-year-old divorce lawyer from Pensacola, FL, who currently resides in Orlando, FL; and Julie Rosenberg, a 46-year-old toy maker from Baltimore, MD, who currently resides in New York, NY. Once gathered together, Kama and Lesu got their first look at the new Manu tribe following Wendy's vote off. Wardog noted original alliances seemed to still be intact, with eight former Kama members and four original Manu members remaining. Jeff then teased an "iconic moment" was about to happen, and he welcomed back the castaways who had previously been voted out of the game -- Rick, Aubry Bracco, Reem Daly, Chris Underwood, Keith, and Wendy. Jeff revealed to the entire cast these individuals had a choice to make of whether they'd like to continue playing the game on an island called the Edge of Extinction or quit and head to Ponderosa. Every player voted out opted to play for another shot to win the $1 million. Jeff did not reveal the details of Extinction Island, but he did tell the cast Aubry, Reem, Rick, Chris, Keith and Wendy had to work every bit as hard as the original castaways in the game. "Wow," David could be heard whispering. It then became time for one of the six voted-out castaways to earn a spot back in the game. The "Edge of Extinction Challenge" required each player to race through a series of obstacles and then maneuver a ball to the top of a very long track shaped like a snake. The first person to finish the challenge would win a spot back in the game. Both Chris and Keith had found advantages on the Edge of Extinction for this particular challenge. Chris was able to practice with bamboo and rope for a part of the challenge in which they had to build a long stick that would retrieve a ring, and Keith was able to hand out a disadvantage to someone -- ultimately forcing Chris to untie 30 knots, which was a lot more than initially required. Aubry got off to a nice lead in the challenge, but it all came down to maneuvering the ball up the track, as it proved to be very difficult. At one point or another, each castaway had to start over. In fact, Wendy, Chris were inches away from winning before their balls dropped. In the end, Rick won the challenge and his competitors cried. Jeff then announced the Edge-of-Extinction twist would continue and the players voted out in the future would have the choice to return to that island and eventually compete for another spot back in the game. Once the original players left the competition, Aubry started bawling her eyes out. "Survivor has just given me so much in my life and I owe so much to this game and am grateful. But I got played, and I got played hard. I am proud to stand with these guys... and I don't think I would have grown up without Survivor," Aubry told Jeff. Aubry, Wendy, Keith, Reem, and Chris were devastated but very proud of themselves for not giving up and raising that white mast. However, Jeff then revealed these five players could choose to return to the Edge of Extinction if they'd like to. "Let's f-cking do it!" Aubry yelled, as everyone else cheered and jumped up and down. "I am not out of it! I am still playing Survivor." Later that day, the newly-merged tribe enjoyed its feast and everyone had a feeling of excitement and joy. Julia hoped the original Kama eight would stick together and maintain the majority. Rick attempted to make personal connections so he wouldn't be the easy vote back to the Edge of Extinction, and Julie was rooting for him to stay given everything he had to go through. Meanwhile, Keith and Wendy regretted coming back to the Edge of Extinction and decided to quit the game. "It hit me, 'If I get off this island now, I've gotten more than what I ever came with," Keith said, who admitted he felt "down" again after taking the boat ride. And Wendy explained, "I don't think anyone has had an experience like I have. Everything that could've gone wrong did go wrong, but at the end of the day, I feel so proud of myself, and that's what is most important to me." Back at the merged tribe, who called themselves Vata, Kelley spoke to Lauren about how they, along with Wardog, were probably in trouble. The girls, however, had two idols to use. Kelley felt she was at Joe's mercy because he was in the majority alliance, and she called it "a nightmare" for her. Joe revealed to Kelley he didn't trust most of his Kamas because they were all together and he and Aubry had been on the outs. Kelley said she could picture David and Rick shifting and making big moves. Kelley therefore came to the conclusion it would make sense to pitch an easy and safe vote to Kama 1.0 -- sending Rick back to the Edge of Extinction. Julie admitted Kelley and Lauren seemed to be playing "brutal" games and maybe one of them should be voted out. On Day 18, Rick found a little something in his bag and it turned out to be two halves of an Immunity Idol. Rick learned he had to give half to another player and then if both castaways remained in the game after the next Tribal Council session, they could put the halves together to make an idol with full power. Rick was therefore unable to use the idol at the upcoming Tribal Council post-merge. It was his only bargaining chip to hopefully get him past the next vote. Rick felt he could trust David the most, and so he shared the news of the idol with him and planned to give him half. On Day 19, Vata met Jeff for the season's next Individual Immunity Challenge. Jeff instructed each castaway to stand on a narrow beam while balancing a statue on the end of a pole. At regular intervals, the players had to move farther down the beam, making it more difficult to balance and remain standing. Players dropped pretty quickly, and but Julie, Lauren, and Joe were still standing after 40 minutes. Despite being rock steady, Joe was out next, and he was then followed by Lauren. Julie therefore won the first Individual Immunity Challenge of Survivor: Edge of Extinction. Julie was so thrilled about her victory that she cried, saying her husband and kids would be so proud of her. Kelley said everyone appeared to be onboard with taking Rick out but chaos could ensue given everyone just merged. She was fully prepared to use her idol if necessary. Julie then spoke to Victoria about getting Kelley out. She didn't intend on going along with what everyone else wanted, which was a split vote between David and Rick. Julie therefore asked Rick to trust her and informed him of Kelley and Lauren's plan to take him out. Rick felt betrayed by his former Lesu members. But Ron was scheming to vote off Joe behind his back. When the pair talked about whom to vote for, Ron accused Joe of being vague. "If Joe loses, it's a great opportunity. Because if you're playing Survivor and you have a chance to take out Joe, every time is the right time," Ron said in a confessional. Ron's goal was to convince the "Kama 6" -- which included Eric, Julie, Julia, Victoria and Gavin -- that Joe needed to go that night. Victoria preferred the Kelley vote, but she didn't know what would be the best move to make. Gavin noted there were three good options on the table -- Joe, Kelley or Rick -- and he just needed to decide what would benefit his game the most. There was not a general consensus about whom to vote out because everyone had a good case to make for each potential target. At Tribal Council on Night 19, Jeff welcomed the jury members: Aubry, Reem and Chris. Victoria declared it would be "straight up evil" to send Rick right back to the Edge of Extinction and there were biggest threats and targets left in the game. Rick said Joe painted all day and it was "weird." He didn't know whether Joe just felt comfortable having the power with Kama or was so scared he refrained from talking strategy with anyone. Joe said he felt safe with the alliances he had made and decided to rest assured and not scramble. After everyone cast their votes, no one played a hidden Immunity Idol. Jeff then read the votes in the following order: Rick, Kelley, David, Rick, David, Kelley, David, Joe, Joe, Joe, Joe and Joe. Joe seemed shocked and disappointed. "You made a big mistake," Joe said on his way to Extinction Island. "Easy decision. You just left the door wide open -- worst thing they could have done." The episode's closing credits later showed that Ron, Julie, Julia, Gavin, Victoria and Eric voted for Joe. Aurora and Joe voted for Rick, while Rick and David voted for Kelley. Kelley, Wardog and Lauren voted for David.